There are various electrical signals in nature are analog, that means a quantity change directly with another quantity. Where the first quantity is voltage while another quantity can be anything like force, temperature, light accelerations and pressure. For instance, in IC LM35 temperature sensor the o/p voltage changes depending on the temperature, so if we could measure voltage, we can calculate the temperature. But, most of the microcontrollers are digital in nature. They can only distinguish between low or high level on i/p pins. For example, if i/p is greater than 2.5v then it will be read as high (1) and it is less than 2.5v then it will be read as low (0). So we cannot directly measure voltage from microcontrollers. To rectify this problem most of the microcontrollers have analog to digital converter unit which will convert from a voltage to a number so that it can be handled by a digital system like microcontrollers. This allows us to interface all types of analog devices with microcontroller unit. Some examples of an analog devices are temperature, light, touch, accelerometer and microphone for recording of audio. Please follow the following link for : Types of analog and digital sensors with applications. Analog to digital converter in PIC microcontroller is discussed below. The term PIC stands for programmable interface controllers, which can be pre programmed to carry out a huge variety of tasks. The production line can be controlled by a preprogrammed microcontroller with timers. The applications of PIC microcontrollers mainly involve in various electronic devices like electronic gadgets, computer control systems, alarm systems. Different types of PIC microcontrollers exist, while the finest are probably found in the GENIE range of programmable microcontrollers. PIC microcontrollers are programmed and replicated by circuit wizard software. These microcontrollers are somewhat inexpensive and can be bought as kits or pre-built circuits that can be designed by the user. Analog to digital converter is essential in an embedded system because, while these systems deal with digital values, their surrounds usually involve various analog signals. These signals need to be changed into digital before being treated by the microcontroller. 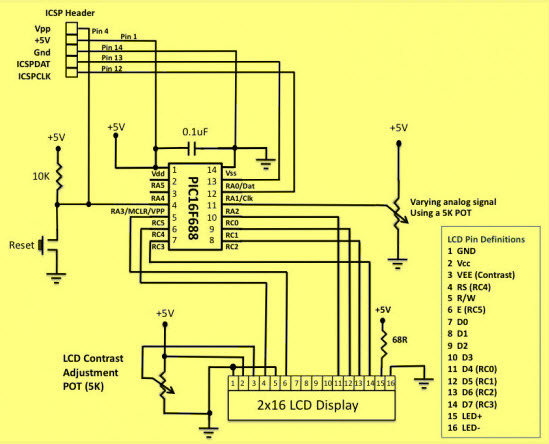 Currently, we can see how to read an exterior analog signal using PIC microcontroller and display the digital output conversion on an LCD display. The input signal will be a changing voltage between 0 to 5v. The most important specification of analog to digital converter is the resolution. This specifies how exactly the ADC measures the analog i/p signals. The common ADCs available in the market are 8-bit, 10-bit and 12-bit. For instance, the reference voltage of ADC is 0-5 volts, then a 8-bit analog to digital converter will break this voltage into 256 parts. So it can calculate it exactly up to 5/256v= 19mV approx. While the 10-bit analog to digital converter will break the voltage into 1024parts. So it can calculate it exactly up to 5/1024= 4.8 mV approx.. So you can observe that the 8-bit ADC cannot tell the variation between 1mV & 18mV. The analog to digital converter in PIC microcontroller are 10-bit. The other specification of the ADC is the sampling rate, that specifies how fast the A/D converter can take readings. 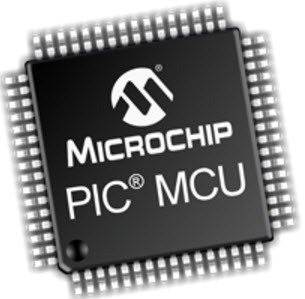 Microchip claims the ADC of the PIC can go high as 100k samples/Sec. Analog to digital conversion module in PIC microcontroller usually has 5-i/ps for 28-pin devices and also 8-i/ps for 40-pin devices. The change of analog signal to the PIC , ADC module effects in equivalent 10-bit digital number. The ADC module with microcontroller has a software selectable low and high voltage reference i/p to some combination of VSS, VDD, RA2 & RA3. In the following project we will convert analog input to digital number with high voltage reference and low voltage reference. The o/p will be shown using LEDs. You can alter the reference voltages by arranging the ADCON1 register. The circuit diagram of the 10-bit analog to digital converter using PIC microcontroller is shown below. The test i/p voltage of ADC is received from a 5k potentiometer connected across the potentiometer, and it connects to the two pins (AN2/RA2) of the PIC microcontroller.The power supply is selected as the reference voltage for analog to digital conversion. Thus, the 10-bit A/D converter will change any analog voltage to a digital. The output will be displayed on the LCD display. The programming of A/D conversion in PIC microcontroller includes arranging the registers like ADCON0, ADCON1 and ANSEL. ADCON0 register is used to choose the analog i/p channel, start the conversion and to check the conversion is completed or not and also switch ON/OFF the module. ADCON2 register is used to choose the A/D data format, fix a acquisition time, A/D clock setup. As an analog input AN2/RA2 is used, the equivalent ANSEL register must be fixed. In register ADCON0, clear HS0 & CHS2 and set CHS1, so that the channel AN2 will be associated with the internal S&H circuit (sample and hold circuit). In the ADCON1 register, clearing the VCFG bit will choose the voltage supply for analog to digital conversion. This register is used to select the CLK source in analog to digital conversion. Though, the MikroC Pro for microcontroller has got a built in library function termed as ADC_Read (), by default, uses the internal RC CLK for ADC operation.So no need to reset the ADCON1 register. Thus, this is all about analog to digital converter in PIC microcontroller, which includes what is a PIC microcontroller, analog to digital converter, ADC in PIC microcontroller and the required software. We hope that you have got a better understanding of this concept. Furthermore, any queries regarding this concept or PIC Microcontroller Projects or electrical and electronic projects, please give your valuable suggestions by commenting in the comment section below.Here is a question for you, what are the applications of analog to digital converter?